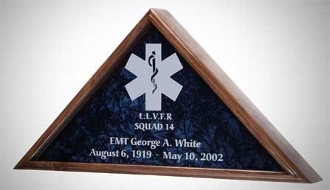 Our EMT Flag case, Medical Flag display case was designed specifically for the Burial, or Casket Flag which, when unfolded measures 5 ft. x 9-1/2 ft. These EMT Flag case, Medical Flag display case will also beautifully display your folded 5 ft. x 8 ft. and 4 ft. x 6 ft. American flags. Each of our expertly crafted flag cases is made in USA using finely detailed hardwood molding in solid oak, walnut, or mahogany. Crisp, clean, simple, and refined our plain glass flag display cases will surely fulfill your flag case needs. We offer personalized laser engraving on the inside of the glass of our large flag cases or on a brass plate. Engraving on the inside of the glass keeps the engraving protected and makes cleaning easier. Your flag case will be a lasting heirloom that can be passed on for generations. Orders for the EMT Flag case, Medical Flag display case are usually shipped out within one business day to places within the USA and Canada.